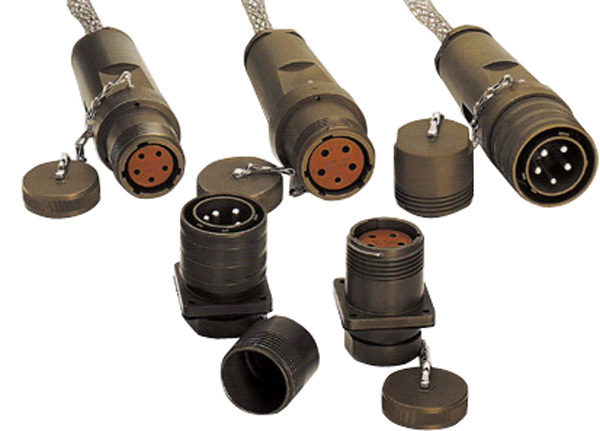 MIL-DTL-22992 Class L connectors are heavy duty, IP67 rated, power connectors built to withstand the rigors of power distribution applications for the most demanding military applications. 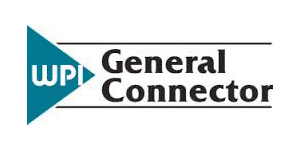 Connectors are designed with current-specific ratings ranging from 40 to 200 amps and incorporate various safety features to protect equipment and personnel. MIL-DTL-22992 Class L connectors are built in specific configurations prescribed by MIL-DTL-22992 for either military or industrial applications. 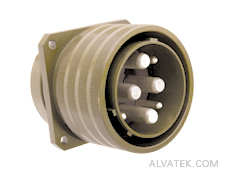 This type of connector is required for all ground power equipment by MIL-STD-454, and are considered the preferred connector under MIL-STD-1453, which mandates its use in all equipment procured by the military. This rigid configuration control ensures correct interconnection of electrical circuits for maximum personnel safety and ultimate reliability. MIL-22992 Class L connectors are the Rolls-Royce standard for military and heavy industrial power built with personnel safety and protection in mind. In particular, shell style and contact type are specified for safe installation. Wall mount and cable connecting receptacles are supplied with socket contacts only and always lead from the power source. 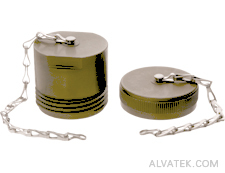 Plugs (with coupling rings) only have pin contacts and always lead to the equipment end. Shell sizes are directly related to the current carrying capability of the connector, which reduces the possibility of inadequate wiring for heavy electrical loads. 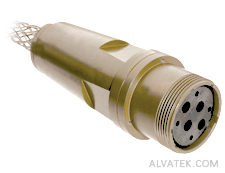 MIL-22992 connectors are built to withstand harsh environments and are IP67 rated. Aerospace-grade alumium shells provide heavy-duty protection while a standard olive drab cadmium finish provides excellent corrosion resistance. Four available connector shell styles provide design flexibility for modern power distribution. The MS90556 cable plug features an integrated backshell and cable grip for environmental protection and strain relief. 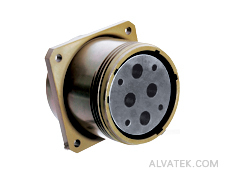 A protective cover is included with the connector to ensure high reliability in harsh environments. The MS90558 style wall mount plug is intended for installation on equipment receiving power. It features pin contacts for equipment and personnel safety, along with a heavy-duty shell and a dust cover for reliability in harsh environments. The MS90555 wall mount receptacle features a four-hole flange for mounting on the power source of MIL-22992 applications, and socket contacts to ensure safety. 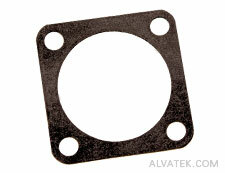 A mounting gasket and dust cover are included for additional reliability. The MS90557 cable mount receptacle is made with socket contacts to connect power to MIL-22992 compatible equipment, or for extension cord applications. The integrated backshell with cable grip provides both strain relief and environmental protection. 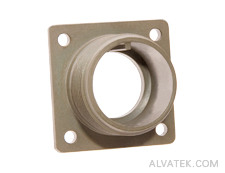 Dust covers are included with MIL-22992 connectors and should always be used to environmentally seal and protect connectors from damage. 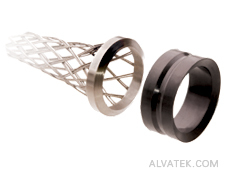 Covers protect contacts and coupling threads, ensuring reliable coupling. A cable grip and sealing gland are included with MIL-22992 in-line connectors. 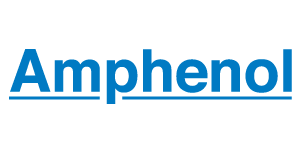 The grip provides necessary strain relief from heavy cable bundles and protects contact terminations, while the gland seals the connector from environmental hazards. MIL-22992 contacts accommodate 6 to 4/0 AWG wire and are rated for up to 200 amps. If one becomes bent or broken, it can be replaced without sacrificing the entire connector. Connectors, Plugs and Receptacles, Electrical, Waterproof, Quick Disconnect, Heavy Duty Type, General Specification. This specification covers multi-contact, heavy duty, quick disconnect, waterproof, electrical plug and receptacle connectors and associated accessories for electronic and electrical power and control circuits. 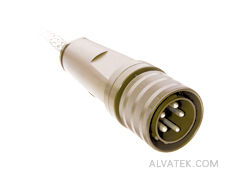 Connectors are rated for temperatures between -55 Degrees C to +125 Degrees C. See 6.1 for intended use and applications.